NUEVA GRANADA, El Salvador, Feb 27 2017 (IPS) - The Izcanal Radio and Television set is simple and austere, but this TV station made history in El Salvador, being the first, and until now the only one, to make the leap from community radio to community TV channel, in 2006. It has done this through a local cable TV station, not an open signal channel, but that could change very soon. “Our greatest wish is to compete for Izcanal to have its frequency and broadcast on an open signal channel; that’s our dream,” said Wilfredo Hernández, news coordinator at the Izcanal station, which was born in February 1993 in Nueva Granada, a town in the eastern department of Usulután. Izcanal’s signal reaches across this town to 35 surrounding municipalities, but to receive it you have to pay for cable TV service. Its programming is focused on showing positive developments and initiatives in the community, revolving around themes such as local development, women and gender, environment, a culture of peace and migration. “The major media outlets don’t show the good things that are happening in the communities, we offer this option,” said Sandra Juárez, coordinator of programming and content, while she edited an audio file on a computer. Hernández and Juárez hope that radio and television, which are currently dominated by private commercial stations, will become more open and democratic, but to achieve that the authorities would have to generate the appropriate conditions. They told IPS that the legal and operational foundations are in place to open up to new alternative projects, which would lead to a strengthening of the freedom of expression. The government of leftist President Salvador Sánchez Cerén has announced the launch of digital TV in 2018, a new technology which will optimise the bandwidth and could make way for new stations, especially community, public and academic stations, among others. For the shift from analogue to digital, the authorities chose the ISDB-Tb model, known as the “Japanese-Brazilian” model, used throughout Latin America, except in Colombia and Panama. Social organisations grouped together in the Network for the Protection of the Right to Communication (RedCo) are fighting for El Salvador’s General Superintendency of Electricity and Telecommunications (Siget), the regulator of the sector, to promote the incorporation of these new players in the TV frequencies and also to open spaces on the jam-packed radio spectrum. The expansion of the radio spectrum gained momentum following the reform of the Telecommunications Law in May 2016, which acknowledges community and other non-profit stations, and established alternate mechanisms for them to participate in the allocation of frequencies, such as direct allocation and a tendering process. When the 1980-1992 civil war ended, a score of community stations were operating, initially broadcasting without a license from private frequencies, which led to crackdowns by the police. In 2008, they managed to secure, through third parties, an FM license, which they fractioned and divided into zones to broadcast their programming, although with interference. For years they struggled for the elimination of the auction system, imposed by the now reformed 1997 Telecommunications Law, a scheme that prevented community stations from competing on an equal footing. In 2015, the Supreme Court came down on their side, ruling that something other than the auction system should exist, to guarantee the participation of these actors, in response to appeals on the grounds of unconstitutionality filed by social organisations in 2012 and 2013 against this mechanism and other aspects of the law in force at the time. 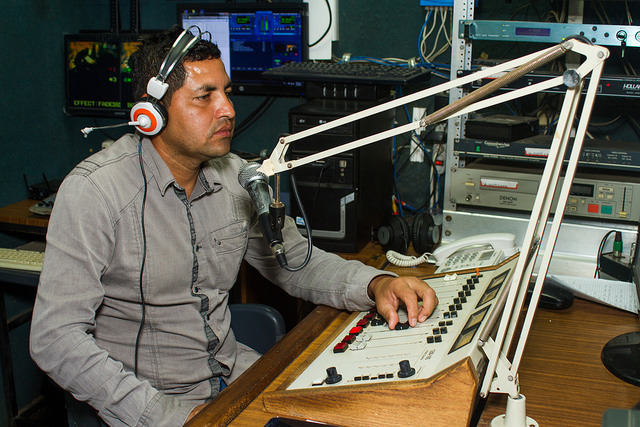 The inclusion of these new players in radio and television would give the country’s media a more pluralistic and inclusive character, which would strengthen freedom of expression, said Leonel Herrera, head of the Association of Participatory Radios and Programmes of El Salvador (Arpas). “The right to freedom of expression has to do with access to different sources of information and spaces for participation, and when the media system is exclusive and corporate, there is no way of guaranteeing this right,” Herrera told IPS. But the idea of extending the allocation of frequencies faces heavy opposition from commercial radio stations, controlled by five corporate consortiums, which account for 92 per cent of the spectrum, according to Siget. The segment for open TV is almost entirely in private hands, although of the 42 existing stations, seven are not commercial and are run by religious organisations, and two others are state-run. But the entry of new players, in radio as well as in television, cannot be taken for granted, and if the current system remains as it is, blocking the entry of other participants, the media will become even more concentrated in fewer hands, said Herrera. In the case of television, the digital platform and its greater bandwidth would allow diversification, but Herrera argued that the existing license-holders intend to keep the extra bandwidth for their channels. In radio, the panorama is even more complex, because the radio spectrum is full and the commercial consortiums refuse to give space to community stations, although there are proposals to divide the frequency bandwidth to double the space. “Siget must comply and make room, otherwise the reform that acknowledges community radio stations will only remain on paper,” said Izcanal’s Hernández. A request from IPS for an interview with the superintendent of the regulator, Blanca Coto, received no answer. An opportunity for new licenses in radio could open this year, during the renewal of frequencies, a process which takes place every 20 years. Until the reform in 2016, they were automatically renewed, a mechanism which practically ensured the concessionaires a license for life..
Now they must meet requisites such as keeping up with payments, failing to commit serious infringements, and making proper use of the broadcast signal. But RedCo argues that with these standards almost every station will manage to get its license renewed, and that other aspects should be taken into account, such as whether the license was originally obtained in a transparent, legal manner. A report from the Presidential Secretariat of Participation, Transparency and Anti-corruption revealed in September 2016 that 60 per cent of the concessions granted before the 1997 Telecommunications Law have no paper trail to verify their allocation. The then regulatory body used to grant frequencies as an award for political favours or to benefit relatives or friends of the right-wing National Republican Alliance (Arena), in power from 1989 to 2009. If Siget includes this transparency factor proposed by the organisations that make up RedCo, some licenses may not be renewed, giving community stations a chance. But even if community stations are granted radio and TV licenses, this would not be enough to bring about a more democratic media system. To do that, the state must back up these measures with public policies aimed at promoting and developing community radio, said the interviewees. The RedCo organisations have submitted a Proposal for a Public Policy in Communications, to contribute to a debate that, in the end, should generate clear measures to democratise the media in El Salvador.